How long does the self-evaluation take? The Ergonomic Self Evaluation takes most people 30-45 minutes of uninterrupted time to complete. I need to buy some equipment for my workstation – do I need permission? No. Most ergonomic equipment can be bought the same way as a stapler for your office. Talk to your department’s manager for information on ordering office equipment. If you need specialized equipment, please contact Risk Management. Where can I learn more about Ergonomics? Great! You can learn more about ergonomics by visiting the District’s Risk Management page or by visiting the CDC’s website. Are repetitive stress injuries (RSI’s) preventable? Yes, with good ergonomics and behavior/tool modification, most of the time RSI are preventable and reversible. Early detection is important to remediate the problem before it is too late. Ergonomics is the practice of adapting a job to the person so work can be performed without harmful strain or injury. Said another way, it is the science of fitting the job to the person. Effective ergonomics reduces discomfort and injuries and increases job satisfaction and productivity. A musculoskeletal injury (MSI) is defined as an injury or disorder of the muscles, tendons, ligaments, joints, nerves, blood vessels, or related soft tissue that may be caused or aggravated by work. It includes sprains, strains, and inflammation. What if I don’t feel better after I adjust my workstation? It is not uncommon to feel a slight discomfort after adjusting your workstation. The body takes time to adjust to the new position – typically around 3 to 5 days. If you don’t feel better in 3 to 5 days, then you should request an on-site ergonomic evaluation. It might be that you need a professional to help adjust your workstation. You can use the self-evaluation up to 365 per year. Can I still see an ergonomist after I take the self-evaluation? Yes, the self-evaluation is the first step in the ergonomic process and provides you with the information you need to make changes today. If you are still experiencing difficulties with your workstation setup, you may request to see an ergonomist or risk management specialist using the request contact form. Why should I do a self-evaluation? A self-evaluation is the first step in the ergonomic process. It allows you to quickly identify issues that may not be ergonomically correct, so you can make changes to your workstation today. Most times, achieving ergonomic bliss just requires a simple adjustment. Will I get a certificate for taking the self-evaluation? Yes, you will receive a certificate of completion upon finishing the self-evaluation. Although you have received a certificate of completion, please keep in mind that you make re-take the self-evaluation as many times as you like. 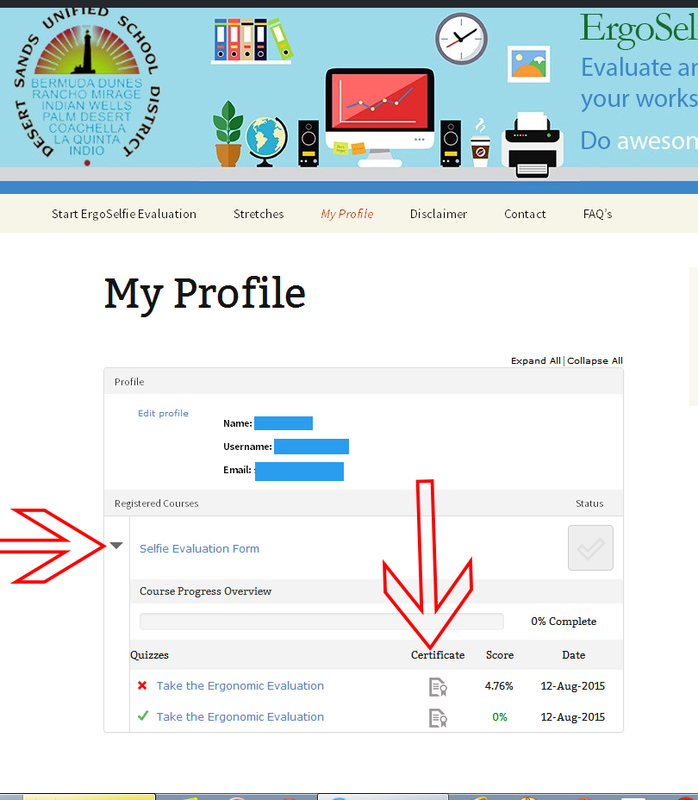 If you need to reprint a certificate, simply click on the profile page above, then click the arrow next to the course to expand your content, then click the icon next to the certificate you want to reprint. It will open a .pdf download box for you to save your certificate.